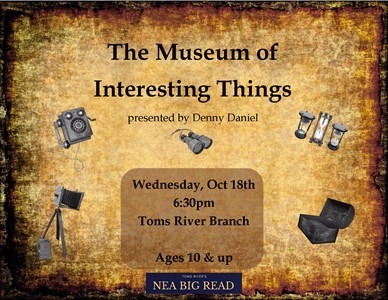 Denny Daniel is the curator and founder of The Museum of Interesting Things, a traveling interactive demonstration and exhibition of antique technologies and inventions that he's bringing to Ocean County Library Oct. 18 as part of Toms River's NEA Big Read. Ever a showman, Denny inspires kids and adults to be curious and to tinker. The exhibition will demonstrate what life was like as it relates to inventions and culture, and will be hands on, interactive and engaging. It will inspire, entertain, and demystify the inventions of various eras. “We like to say that we show people that their iPods did not pop out of thin air,” said Denny. DOOMSDAY! The History of WWII, the Cold War, and the space race. Ever watch The Hunger Games, heard of WWI and WWII? Know about the Cold War? Did we survive 2012? Have you read WW Z? Doom has been in our lives since life itself began! The Museum of Interesting Things finally delves into some of that to its positive and negative ends. The good, the bad and the ugly of our history and the innovations that we created and knowledge we expounded on because of these issues and to resolve such issues. Humans adapt, even to doomsday. Innovation & knowledge are key to survival but sometimes fear causes the absurd. Learn it all now ... before it’s too late! Coincides with the NY/NJ/PA/MA Core Content Curriculum Standards for history & DOOM! All are invited to attend and take part in the program, which runs from 6:30 to 8 p.m. Oct. 18 at the Toms River branch of OCL. Many Toms River Regional teachers are offering extra credit to students who attend Big Read events such as this. In Station Eleven, Clark began the Museum of Civilization because he wanted to preserve the memory of what came “before." His goal was to preserve civilization, and he put the artifacts in context. Denny Daniel's Museum of Interesting Things featuring DOOMSDAY will makes it way to Ocean County Library Oct. 18 from 6:30 to 8 p.m.